Head: 3mm Orange Tungsten Bead. After putting the bead onto the hook, place it into the vice and dress the hook with the thread of your choice. 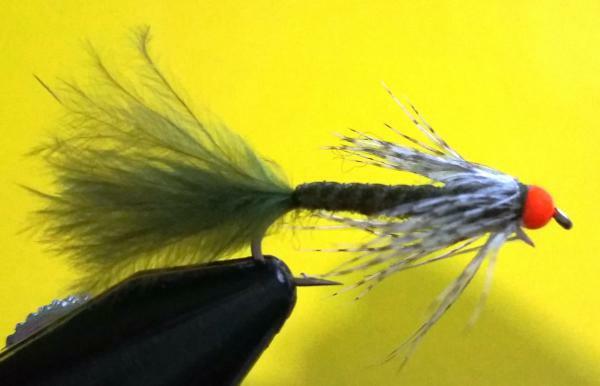 Tie in a segment of Marabou tail feather to equal half the shank length of the hook. Tie in your copper wire and a thin segment of Swiss straw. Fold them back over the tail whilst you dub the abdomen with the olive dubbing. End the dubbing at the halfway mark on the hook shank. Once the dubbing has been tied off, stretch the Swiss straw over the top of the abdomen. (don’t tie it off too tightly as it may snap when ribbing the abdomen. Next, palmer the copper wire along the abdomen to form ribbing. Now you can tie off the ribbing and Swiss straw tightly. 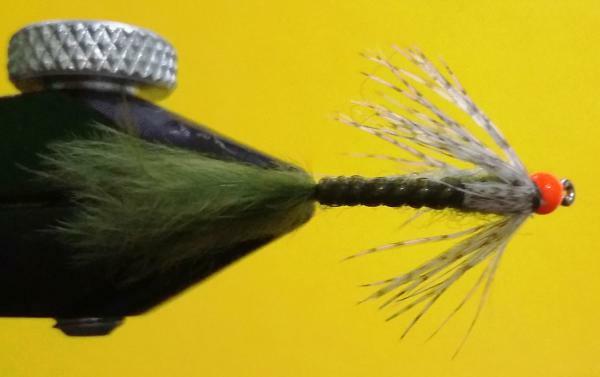 Tie in a segment of barred mallard feather to be used as a wing casing and leave it facing back in order to allow you to dub the thorax to the bead with the olive dubbing. Then comes the fun bit. Using your hackle pliers, grip the front of a barred mallard feather and identify a group of fibres on either side of the vane (approximately 5 mm either side) and strip the rest of the fibres on either side of the feather away. Tie in the tip of the feather (That which you had in your hackle pliers) at the back of the thoracic area. Lay the feather over itself, leaving feather fibres sticking out on either side of the thorax and tie off. Next, bring your wing casing over the legs and tie off. Et voila!! This fly was fished to good effect at Treeferns Trout Lodge, between Belfast and Dullstroom this last weekend, resulting in a number of released trout wishing they had never gone for it. 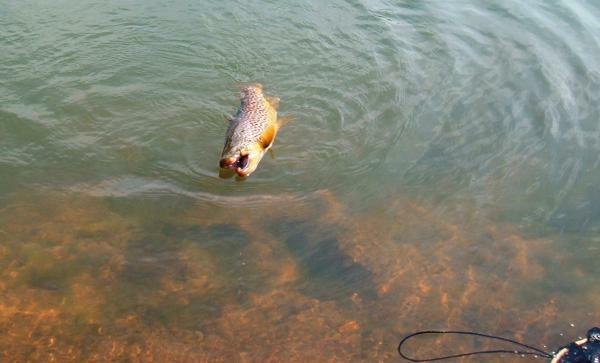 It was also used to catch this 2,5kg Brownie at Wonderwater45. See pic below.